For the first time in six seasons, the Seattle Seahawks will not be a part of the NFL’s playoff party. Seattle came up short in their Week 17 attempt to secure the final Wild Card spot in the NFC, falling to the Arizona Cardinals on a late field goal while the Atlanta Falcons simultaneously eliminated the Seahawks with a win over the Carolina Panthers. Earl Thomas and his teammates needed Carolina’s help to stand a chance, but the Panthers offense went dormant in the second half of their contest and five second-half Matt Bryant field goals boosted Atlanta to a win that already had Seattle out by the time Phil Dawson lined up and connected to give the Cardinals a 26-24 lead with under three minutes to go in Seattle. Arizona held on from there. 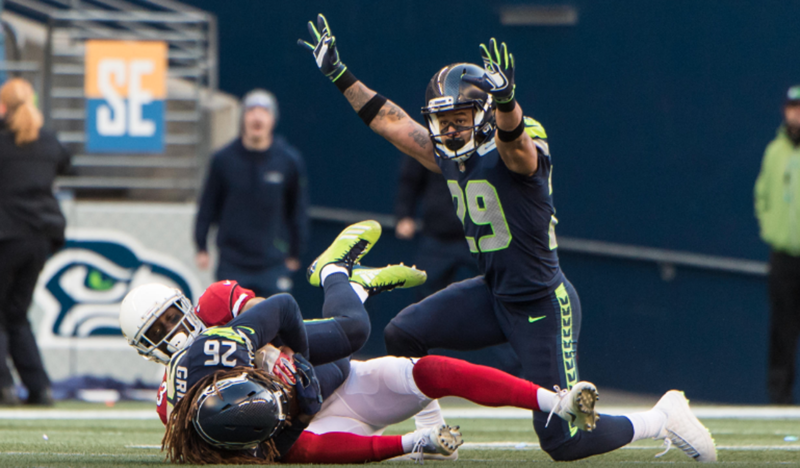 It was not exactly a banner day for the Seahawks defense, which gave up 20 first-half points to their division rivals. However, they did buckle down in the second half to give the team a chance. Earl finished with six tackles and a pass breakup. He also came up with a key assist in coverage to help teammate Shaquil Griffin nab his first career interception. Thus ends Earl’s eighth NFL season. Despite dealing with nagging injuries all year, No. 29 played in 14 of Seattle’s 16 games and recorded 88 tackles, six pass breakups, two interceptions, a forced fumble and his second career touchdown. Asked after the game about his future, Earl, who has one year remaining on his Seahawks contract, gave a classic Earl Thomas response.